OK this is where we are aiming for with this series. This set of pictures is mainly to do with page 3 of the main part of the website. It is very important for iChat that your home Network is set out to be as linear as possible with no over lapping subnets works created by having two devices acting as DHCP Servers. 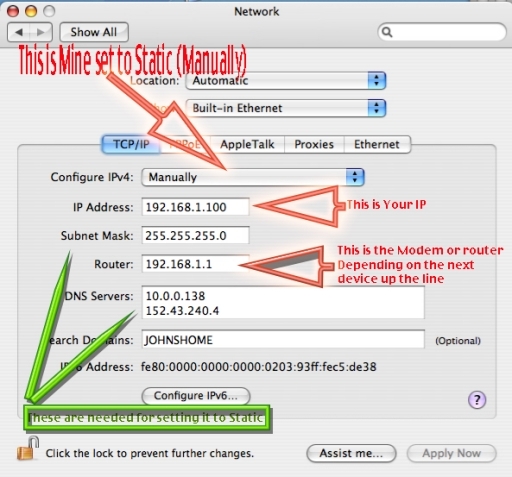 So in here you can look up how you are getting an IP, DHCP or Manually (Apple's Name for Static Routing). What that IP is, What device is apparently the "Router" or at least what IP it has which should tell you something when used in a Web Browser. Somewhat hidden by my overlaid arrows is the fact that the TCP/IP is the Active blue one. In some dispalys like Airport this is not the first tab and you have to select it. Also depending which tab you were on the last time you were in Network, that might be the tab. Basically, select the TCP/IP tab to be the front one. The first red arrow points out that I am set to "Manually" (the Mac's name for Static Routing). Your may say "Using DHCP" as this is the default setting for a Mac. It presumes your Modem or Router that you are connected to is issuing DHCP IP addresses. Suffice it to say that the next two red arrows will point to the same information as to your own IP and that of your Connection device (labelled "Router" here). Now the green set of arrows. These point to the Subnet Mask and DNS servers. Whilst your set up says Using DHCP you should make a note of these if you are going to set up Static (Manually) routing. This is addition to the "router" IP. You will have to type the information into the relevant text fields (as they are shown here). A word on the DNS server Box. The display shows two DNS servers. You type one and then hit the enter/return key, then type the next. It is possible to list as many as you want, but the other will be out of sight. Scrolling does not work here and you have to use the Up and Down arrows to check if the list is longer. What this pictures and words are trying to point out is that this is the place to colletio information on the Mac's IP from whatever device it is connected to, the IP of that device ("Router") and the Subnet MAsk and DSN Servers.